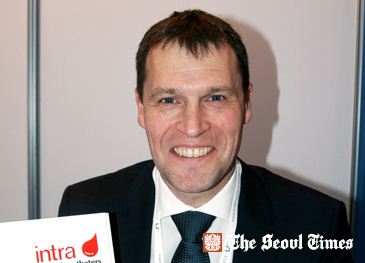 Mr. Jorg Staudt, general manager of "Intra"
"2013 EU Gateway Programme Healthcare and Medical Technologies," an event exhibiting the advanced medical technologies and equipment of European countries, was held at COEX in Seoul's Samsung-dong on March 19-20, 2013. A total of 35 EU companies including Germany, Poland, Belgium, and Czech Republic showed their medical equipment, products, and technology during the two-day event. As part of the related event "Korea-EU Business Networking Reception was held at InterContinental Hotel within COEX on March 19, 2013. Managing Director Jens Wolters of "Finn Comfort"
"We want to export our products to the Korean market," said Mr. Jorg Staudt, general manager of "Intra," manufacturer of special catheters. "We are exporting our products to over 30 countries including China"
Among the exhibitors from EU countries was a shoe manufacturer from Germany. "South Korean is one of the most important markets in the world for us," said Managing Director Jens Wolters of "Finn Comfort," manufacturer of specialized comfort shoes. "South Korea is focusing more and more on health issue"
"We want to provide more comfort to feet of the Korean people," he added. "A lot of pain is caused by wrong foorwear"
About 10 companies of the exhibitors were from Germany. There were a couple of Czech companies at the exhibition. "Our main reason was to understand Korean market and try to find local distributors," answered General Manager Tomas Latal of "Trios," a Czech manufacturer of microbiological instrument and ready-to-use culture media. For details or inquiries call 02-6000-5208.